Imagine how difficult it would be to illustrate what it's like to be deaf and blind. 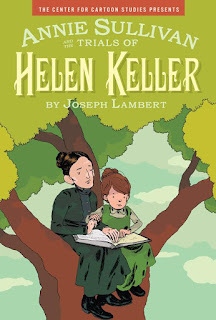 It seems impossible to me, but Joseph Lambert was able to do it in the very beginning pages of Annie Sullivan and the Trials of Helen Keller. Set against a black background, a white outline of Helen shows her struggling with a spoon and other objects being forced upon her. 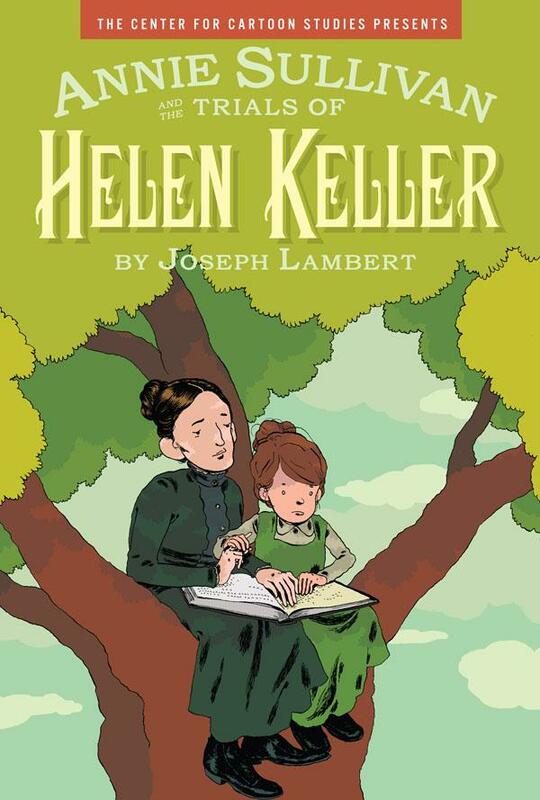 The shadowy figure of Helen Keller may start the story, yet this book belongs to Annie Sullivan, her famous teacher. Diving into Sullivan's difficult childhood as an orphan with poor eyesight, the reader gets a well-rounded picture of a historical figure who is exalted in the public's eye. Sullivan was hardworking and dedicated, true, but she was also difficult and obstinate. On a personal note, my mother worked at the Perkins School for the Blind, so I loved learning more about the school's history and its relationship with Sullivan and Keller. My one quibble is the type that Lambert chose. Much of the book is written as a letter from Sullivan, and her cursive is faint and small. I found this print to be tiring to read. Regardless, it is worth the effort; this is a book worth sharing. I love the look of this book. I haven't read many graphic novels but am discovering quite a few here on your blog!